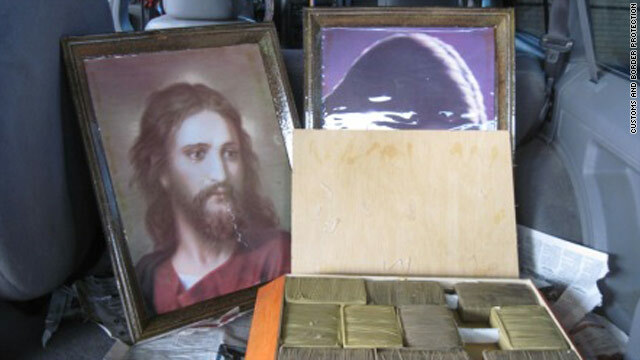 The U.S. Customs and Border Protection agency says it found marijuana hidden in framed pictures of Jesus Christ. (CNN) -- A marijuana bust along the U.S.-Mexico border revealed 30 pounds of the drug stuffed into framed pictures of Jesus Christ, the U.S. Customs and Border Protection agency said Wednesday. "This is not the first time we have seen smugglers attempt to use religious figures and articles of faith to further their criminal enterprise," said William Molaski, port director of the agency's office in El Paso, Texas, in a statement. "What some might find offensive or sacrilegious has unfortunately become a standard operating procedure for drug smugglers. This would include using religious symbols, children and senior citizens in their attempts to defeat the CBP inspection process." Authorities said a 22-year-old woman in a Jeep from Juarez, Mexico, told federal border patrol officers that she had nothing to declare besides the framed art. The officers checked out the vehicle with Cesar, a federal drug-sniffing dog, who alerted them to three framed pictures of Jesus in the vehicle. The officers pulled the backing of the pictures and found numerous bundles, authorities said. The woman was arrested. The bust was one of three marijuana seizures made Tuesday at the El Paso point of entry. Officers said they seized 214 pounds of marijuana in the two other busts.